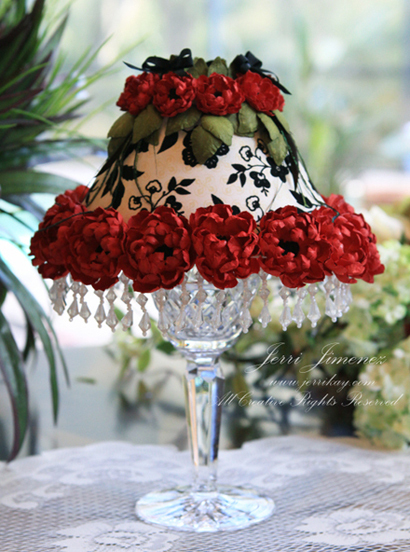 Today I want to show you the tea light shade I designed to coordinate with the Valentine’s designs for CHA. This design can be used for other occasions as well, such as an anniversary or wedding. I love how fun this piece is and it was relatively easy to pull together. Two sets of Spellbinders™ dies were used, Blossoms Three and Foliage. I absolutely love these dies and see myself using them quite a bit in future designs. I used a 12 x 12 sheet of LA Creme designer paper for the light shade. I selected this paper because it speaks romance to me! The leaves and flowers were made first. I traced the shade template onto the LA Creme DP with a pencil and cut it out. The shade was adhered with 1/4″ double sided tape. The crystal tassels can be found at Michael’s in the bridal section. Aleene’s Quick Grab Tacky Glue worked perfectly for adhering the tassels to the shade. I let the adhesive dry before continuing. The larger roses were attached with the same adhesive and left to dry. This part is a bit tricky, you have to space the roses equal distance around so that you don’t run out of room when you place the last rose. I wanted a more natural draping effect with the leaves, some were arranged to hang lower than others. Once the adhesive was dry, I added the smaller roses at the top of the leaves. A few feathers were tucked under the leaves around the shade and black silk bows topped it off. The shade sits beautifully on a wine glass. For a romantic evening, insert a battery powered tea light inside the glass (can be found at Michael’s) and dim the lights. I have a flickering light that is very nice, it gives the appearance of a candle flame, very romantic. The shade can be used over and over again. To store the shade, place it on a wineglass in your china cabinet . . . so gorgeous! Now, isn’t this a fabulous place setting! It would make a gorgeous bridal table setting. Misc. : Feathers (Silk Warehouse), Lady Bug Sew On Bead, Black Glass Beads (Michael’s), Sponges, Aleene’s Fast Grab Tacky Glue, Embossing Tools, Embossing Pad, Crystal Fringe (Michael’s), Double Sided Tape Thank you so much for stopping by to visit today, I’ll see you in a few days! Girl, you are amazing. This is just GORGEOUS!!! Those flowers are incomparable!! What an absolutely fabulous piece. Keep ‘um coming, because this is a feast for the eyes and and inspiration to us mere mortals. Thanks for this closer look. Those flowers are amazing! Truly amazing!!! And inspirational! The shade on a wine glass with a tea light in it — yes! OMG! Jerri you have out done yourself on these flowers! I saw the set yesterday and thought how drop dead gorgeous they were. The red and black together are awesome. Thanks for sharing with us. I love it! This is SO beautiful — absolutely gorgeous! What a FUN home decor project to make and be able to use! O my word Jerri this is absolutely stunning…the flowers are exquisite. I’m so pleased Spellbinders have chosen to to design for them otherwise I may never have come across your stunning creations and so much inspiration. Thank you so much for sharing it all with us. Can’t wait for these new dies to come over to the UK. Was there ever a more lovely use for paper and card? This is exquisite Jerri. These would be perfect to use at our Ruby Wedding Anniversary dinner party in March, but given my crafting talent, any I made would be very unlikely to stand close inspection by our guests! Gorgeous, Jerri! I love how you lined the shade with thhose gorgeois flowers. Beautiful, if only I had half your talent! Jerri. 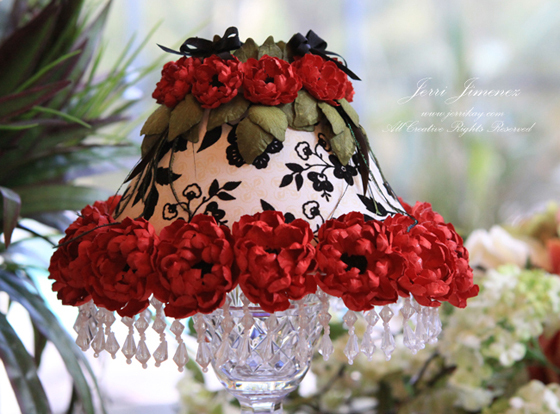 what a beautiful way to dress up a lamp shade. Great colors and beautiful flowers. soooooo sweet and beautiful ! Absolutely stunning! You have quite the hand to make such beautiful flowers. Gorgeous! I like the idea of having the flickering tealight in it. Such beautiful flowers! Thanks for sharing! Ingenious…I thought it would be larger until I read it could be placed on a wine glass. The possibilities are endless for different occasions. This is quite lovely….beautiful job Jerri. Jerri, yet another amazing creation from you! You never cease to create such gorgeous 3-D items and you have outdone yourself again, my friend!!! Love, love, love those flowers…they look so real. When I signed up for your blog I thought “ok another blog maybe some new card ideas” boy was I surprised! Jerri your creations are amazing!!! Thank you for sharing. WOW!! WOW!! WOW!! Absolutely stunning, Jerri. Gorgeous beyond words!! Amazing flowers and truly romantic setting with this gorgeous shade. I love the wine glass/tea light idea, Jerri. 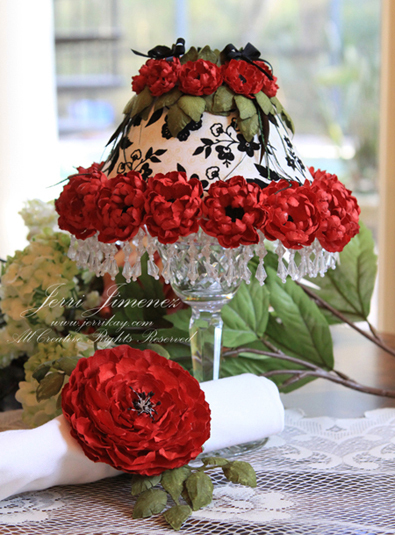 Did you dress up an existing lampshade or create one out of cardstock yourself? If it is one that you made, do you have a template for creating it? Also — is it just sitting on a wine glass and can you really light the tea light in it without sparking up your creation? I would worry! Thanks for answering my questions — this (like all your other work) is lovely and reflects all the time, care and talent you pour into everything you do! Oh my that is just amazing, love every detail and how your flowers and leaves look so real!! FABULOUS!!!! Thank you for much for your inspiration and THANK YOU for the tutorials!!! I have struggled in the past trying to recreate this affect and you just made it perfectly clear, thank you – thank you – thank you! Simply stunning project. The flowers are so beautifully made. Love it!!!! I am amazed at how beautiful this is! You have outdone yourself. Thanks so much for sharing it with us. Jerri yet another Fabulous work of art! Congrats on your new posting of DT for Spellbinders. You are SOOO Worthy, your Art is Breathtaking. Thanks for the inspiration. Absolutly beautiful!! OMGosh you are won very, very talented lady. . . .what I would love to spend several days with you and learn a few things. . . .Thank you so much for sharing and inspiring all of us!!!! Love this valentines lamp! Think I’ll make a couple, really like the idea of using a wine glass with the faux candles – just to cute! Thanks again for the idea Jerri, I so enjoy seeing your creations. Blessings! Stunning!!! As always. Jerri, thank you for sharing. Enjoy your site so much. Jerri, this is absolutely gorgeous! I love the roses and leaves……might just have to buy those Spellbinder’s sets! What a stunning project. I love the red and black together. Looks so elegant. I love that you used these dies for a project like this AND shared the tutorials. Wow Jerri, I am always blown away by your lucious creations! Spellbinders is lucky to have you! How long did it take to make all those flowers? When I did the bridal boquet last year it took me almost a month. But I didn’t work on it every day. You must have been in your craft room for days if now weeks, to get all these projects done! This is just stunning! These dies will have to be on my wish list for sure! I just love your design and the colors that you used,just Gorgeous. I do have a question about making the template for the shade as far as the design paper that you used to cover the shade. How do you draw the template so that the curve is measured right so that it neatly rolls on? Thanks for the help and for sharing! You tea light shades are so gorgeous! WOW!!!! 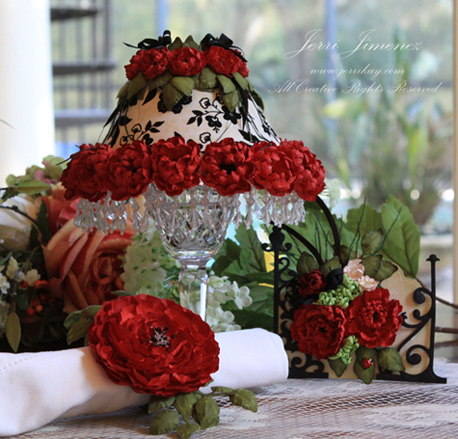 What a fabulous project, Jerri….your flowers are to die for!!!!! I love the classy colors and the little tassels…..over the top, gf!!!! !